Nutella Custard Buttercream - Let the Baking Begin! If you like the hazelnut flavor of the famous Nutella spread, you will absolutely love this Nutella Custard Buttercream! 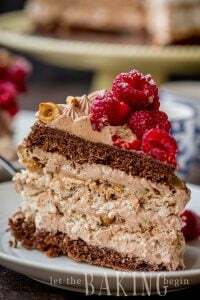 It has the texture of buttercream, without unnecessary greasiness. The suppleness of the Nutella Custard Buttercream allows to pipe the cream on top of cupcakes, while the deliciousness will make this your favorite cake frosting! If you’ve noticed the trend lately on the blog, this recipe too will be used in an upcoming cake. But if you’re feeling independently creative you can use the Nutella Custard Buttercream to layer a regular yellow sponge cake, or chocolate sponge cake, or any other cake you know how to make before I post that next cake recipe. Because the filling does not feel greasy like some of the buttercreams do, you will really be tempted to just eat or ‘taste-test’ this cream by the spoonfuls. Also, if you like your cupcakes topheavy, this is the frosting to do it with. Mix 6 egg yolks, 1/2 cup sugar, 1 Tbsp vanilla extract, 1/4 tsp salt with a whisk until smooth. Add 4 Tbsp flour and whisk until smooth again. Pour milk 1/2 cup at a time while continuously whisking. Cook over medium heat, whisking non stop to prevent clumps from forming and the bottom from scorching. Add 1/2 cup Nutella into the warm cream and whisk until it is well incorporated. Allow to completely cool to room temperature. Do no refrigerate. If you do, bring back to room temperature before adding to the butter. Tip: To speed up the cooling process you can spread the cream in a large baking pan, covering with plastic wrap touching the cream. Whip 1.5 sticks, unsalted, room temperature butter with a mixer on high speed for about 5 minutes, stopping 3-4 times to scrape down the bottom. Add the cooled to room temperature custard into the whipped butter in thirds, whipping until almost fully incorporated before making the next addition. Stop and scrape the bottom of the bowl to make sure there are no unmixed chunks of butter. Refrigerate cream until ready to use. Bring to room temperature before using in cakes or recipes. 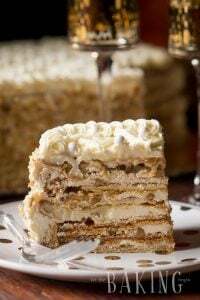 Hazelnut Meringue Nutella Cake Recipe – Chocolate Poppyseed Cake, Hazelnut Meringue and Nutella Custard Buttercream. 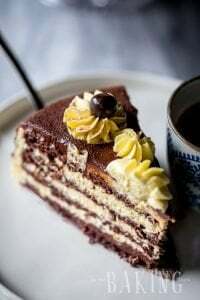 Mikado – Layered cake with chocolate custard buttercream. 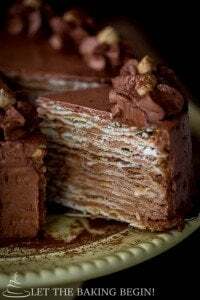 Nutella Napoleon Recipe – Delicious chocolate cake with creamy chocolate buttercream. Add 4 Tbsp flour and whisk until smooth again. Pour milk 1/2 cup at a time while continuously whisking. Cook over medium heat, whisking non stop to prevent clumps from forming and the bottom from scorching. Whip 1.5 sticks , unsalted, room temperature butter with a mixer on high speed for about 5 minutes, stopping 3-4 times to scrape down the bottom. UPD: clarified in the instructions to cool the custard before adding into the whipped butter. I have always thought your supposed to cool custard fast or refrigerate it as soon as possible because, of the egg yolks. Is this recipe correct to cool it at room temperature?? Every baker I asked said you could get food poisoning from room temperature egg yolks if set out to long so custard needed to be cooled immediately is this wrong or would it be safe to use your method? Love your website and all the beautiful cakes. I love to bake and this cake would be perfect for my grandson as he like your dad loves all the same flavors. Thanks again for the wonderful recipes can’t wait to try the peaches and cream cake. Also do you have recipes for the full cakes or are they all just one layer done two times? 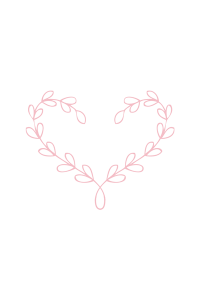 Thank you so much for your question and your kind comments! As to the custard, if you have couple gallons of the egg yolk custard then yes you want to do whatever you can to speed up the cooling, otherwise by the time it cools it can spoil. In our case, the amount of custard is so small that it cools very fast, probably in about 30 minutes or less. That has never been enough to spoil the custard. Any way you do cool it, you need to make sure that the custard is room temperature when you add it to the whipped butter, otherwise the buttercream will separate. Nevertheless if you would like to speed up the cooling process, you can spread the custard on a baking sheet and cover it with plastic wrap touching the custard. This will cool it super quick. Hi, how long do you cook this on the stove for? For about 3-5 minutes after it starts to boil and bubble. 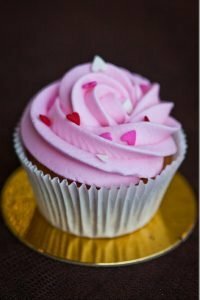 The buttercream turned out too runny, what can i do to fix it? Also now looking back, was it supposed to cool before mixing in with the butter? If so, i would clarify that in the recipe. You are so right, the custard must be cool before adding to the butter. If you already added the butter to the warm custard, I would completely chill, then try to assemble the cake in the cake ring. So sorry for this, somehow it got missed when I typed the instructions :(. I think this would be valuable info to include in the instructions. Also, the 1.5 sticks butter, room temp or cold butter? Hi Marina, do you think this cream would be ok for cream puffs? thank you for your quick reply. I thought it might be too heavy but it sounds so yummy. I will probably give it a try and I will definitely let you know. Thank you! Does the cake need to be stored in the refrigerator after decorating the cake? I know a regular custard needs to be refrigerated, therefore I am assuming that the cake needs refrigerating too. Because the cream has a good amount of egg yolks, it would be best to keep the cake refrigerated.